Hector and his wife, Keilin, have two children, Ian Jose and Dafree...Last name is pronounced ron-DOHN...Originally signed by Cleveland as a non-drafted free agent out of Venezuela on Aug. 3, 2004...signed by Indians scout Stewart Ruiz...Was a Rule 5 selection by the Cubs during the 2012 Winter Meetings...was selected with the second pick in the Rule 5 Draft, one pick after the Astros took Josh Fields with the first overall pick...Pitched for Venezuela in the 2017 World Baseball Classic, where he was teammates with Jose Altuve...appeared in two games... Signed a two-year contract with the Astros as a free agent on Dec. 15, 2017...will be eligible for free agency after the 2019 season. Was solid in both a set-up role and closer role during his first year with the Astros...led the club in relief appearances (63)...posted the highest swing-and-miss rate of his career (30.4%)...ranked 10th among AL relievers in average fastball velocity (97.6 miles per hour)...led all Major League relievers in road ERA with a 0.56 mark (2ER/32IP)...was the second-best single-season road ERA by a relief pitcher in franchise history behind Billy Wagner's 2003 season (0.40)...was scoreless in 30 of his 32 road games...posted a 23-game road scoreless streak from March 30-Aug. 7, a streak that spanned 22.1 innings pitched...was the third-longest streak in franchise history behind Billy Wagner's 30-game streak in 2003 and Tim Byrdak's 24-game streak in 2010... made his sixth-career Opening day roster...had a 13-game scoreless streak (11.1 innings pitched) from May 19- June 17...posted three four-out saves: June 6 vs. SEA, July 3 at TEX, Aug. 3 at LAD...posted multiple strikeouts in four consecutive games from June 28-July 10, tying the longest streak of his career (also June 4-20, 2014)... pitched in two games in the postseason, Games 2 and 3 of the ALCS vs. BOS...pitched 1.0 scoreless inning, allowing 2 hits. Went 4-1 with a 4.24 ERA (27ER/57.1IP) and 10 holds in 61 relief appearances for Chicago...struck out 69 and walked 20...held opponents to a .233 batting average (50x215)...stranded 13 of 23 inherited runners... held opponents scoreless in 44 of 61 outings...produced a 3.02 ERA (16ER/47.2IP) in 50 games when pitching with at least one day's rest...had a 10.24 ERA (11ER/9.2IP) in 11 games pitching on no days rest...had a strong start to the season, recording four holds and posting a 0.87 ERA (1ER/10.1IP) in his first 11 outings through May 2... held opponents to a .086 average and a .200 on-base percentage, walking five and striking out 12...in 20 games from May 3-June 26, had a 6.87 ERA (14ER/18.1IP)...opponents batted .288 with an .857 OPS...walked six and struck out 21...threw a season-high 40 pitches on May 5 vs. NYY...tossed a season-high 2.0 innings on June 8 vs. COL...rebounded from that stretch by going eight-straight games without allowing an earned run (9.0 IP) from June 27-July 19...walked just two, struck out 14 and held opponents to a .172 average...finished the season with 9.0 scoreless innings spanning 10 games starting on Aug. 27...walked none, struck out 12 and held opponents to a .129 average (4x31) and a .290 OPS...did not allow a walk in his final 11.1 innings from Aug. 19 through the end of the season...recorded his first career hit on Sept. 29 vs. CIN, an infield single off LHP Amir Garrett... pitched in three games during the NLCS vs. LAD...struck out four batters in 3.0 innings and posted a 6.00 ERA (2ER/3IP)...prior to the season, pitched in two games with Venezuela in the World Baseball Classic. 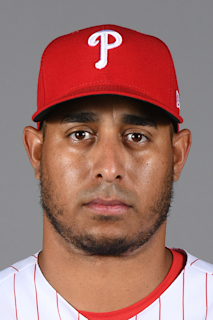 Began the season as the Cubs closer before transitioning to a set-up man role upon the addition of Aroldis Chapman in late July ... posted a 1.72 ERA (6 ER/31.1 IP) in 32 outings in the season's first half before posting a 6.41 ERA (14 ER/19.2 IP) in 22 appearances in the second half ... Served as the team's closer until July 25 ... despite the team recording 59 wins through July 25, he registered just 18 saves due to the team winning 35 games by four or more runs during that stretch ... Allowed one or zero runs in 50 of his 54 outings, including 41 scoreless outings ... Limited righties to a .200 batting average (22-for-110), while lefties batted .260 (20-for-77) ... Appeared in seven playoff games, going 1-0 with a 4.50 ERA (3 ER/6.0 IP) ... Recorded two four-out saves, June 18 vs. Pittsburgh and June 24 at Miami ... has three-career saves of at least four outs ... Led all Cubs relievers with 1.41 walks per 9.0 innings ... walked just eight batters in 51.0 innings ... Converted his first 11 save opportunities, extending his streak to 22 consecutive save situations converted dating to 2015 ... the 22-straight saves are tied for second-most in franchise history with Joe Borowski in 2003-04 ... Ryan Dempster converted a franchise-record 26-straight save opportunities from August 2, 2005-May 1, 2006 ... Was placed on the 15-day disabled list, August 19 (retroactive to August 17), with a right triceps strain ... was activated, September 6 ... allowed eight earned runs in 7.1 innings pitched (9.82 ERA) after his return from the disabled list ... had a 2.47 mark (12 ER/43.2 IP) in 45 outings prior to the stint. Hector Rondon collected 30 saves and posted a 1.67 ERA (13 ER/70.0 IP) for Chicago ... was 30-for-34 in save opportunities and also collected eight holds ... held the opponent to a .212 batting average and a .263 on-base percentage. Was 17-for-18 in road save opportunities, converting his last 12 dating to June 4. Walked just 15 and struck out a career-high 69 ... along with 55 hits allowed, recorded a 1.00 WHIP. Stranded 11 of 14 inherited runners. Posted a 1.19 ERA (5 ER/37.2 IP) in 40 games at Wrigley Field ... had a 2.23 ERA (8 ER/32.1 IP) in 32 road games. Had a 1.10 ERA (4 ER/32.2 IP) in 33 games following the All-Star break ... had a 2.17 ERA (9 ER/37.1 IP) 39 games in the first half. Successfully converted his final 11 save chances dating to August 14 at the White Sox. Converted his first two save opportunities to start the season, giving him a stretch of 17 successful save conversions dating to August 12, 2014 ... the streak ended, April 18 vs. San Diego when he surrendered two earned runs in the ninth - Cubs went on to win 7-6 in 11 innings. w The 17-straight successful save conversions was the longest by a Cubs closer since Carlos Marmol converted 19-straight during 2012. Struck out a season-high three hitters, August 9 vs. the Giants and August 12 vs. the Brewers. Did not allow an earned run in 15 games (15.0 IP), August 6-September 11 ... walked three and struck out 20. Pitched to a 3.60 ERA (2 ER/5.0 IP) in five post-season games ... recorded two saves in the NLDS vs. St. Louis, including the series-clinching Game 4. Hector took over closer duties for Chicago in May and went on to convert 29 of 33 save opportunities...At age 26, was the youngest Cub to reach 29 saves in a single season since Mitch Williams recorded 36 saves at age 24 in 1989...Finished the season by converting his final 15 save opportunities starting on August 12...Became the first Cubs closer to record at least 15-straight save opportunities in a single season since Carlos Marmol was successful in 19-straight save chances in 2012...Posted a 0.62 ERA (2 ER/29.0 IP) with 18 saves in 19 chances spanning 29 games following the All-Star break...Held opponents to a .163 average and allowed just two walks while he struck out 24...All told, finished with a 2.42 ERA (17 ER/63.1 IP) in 64 relief appearances...Was 4-4 with 29 saves and one hold...Struck out 63 batters and walked just 15 ... the opposition batted .218 (52-for-239) and had a .263 on-base percentage with a .264 slugging mark...Recorded a 1.06 WHIP...Did not throw a wild pitch on the season...Retired 49 of 64 first batters faced...Stranded all seven runners he inherited...Had a 0.86 ERA (2 ER/21.0 IP) in 21 road games ... was the third-lowest ERA among N.L. pitchers with at least 20 road games...Started the season with a 7.2 scoreless innings streak, spanning seven outings...Extended his overall career-high scoreless innings streak to 16.2 frames dating to September 3, 2013...Allowed two runs (one earned), April 19 vs. Cincinnati to end his scoreless streak...Recorded his first major league save, April 11 in St. Louis … tossed a scoreless 11th inning to preserve Chicago's 6-3 win...Placed on the paternity leave list, May 30, for the birth of his son, Ian Jose … activated, June 3...Allowed a Devin Mesoraco grand slam in the ninth inning, June 23 vs. Cincinnati, to end a stretch of 47.1-straight innings without a home run allowed dating to August 3 of the previous season...Spun 12.0-scoreless innings from August 10-September 5...Walked none and struck out 11 during the stretch while he held the opponent to a .122 average. Hector was selected from Cleveland in the major league portion of the 2012 Rule 5 Draft, and posted a 2-1 record with two holds, a 4.77 ERA (29 ER/54.2 IP) and 44 strikeouts in 45 relief appearances for Chicago in his first career big league action... Struck out 44 in 54.2 innings, an average of 7.24 strikeouts per 9.0 innings pitched … walked 25... Retired the first batter faced 31 times in 45 outings … stranded six of 12 inherited runners... Held the opponent scoreless in 28 of 45 relief appearances... Ended the season with nine-straight scoreless outings (9.0 IP) dating to September 3 vs. Miami... Tossed a season-high 2.0 innings of relief 11 times... Held left-handed hitters to a .190 batting average (19-for-100)... Went 1-1 with a 3.20 ERA (9 ER/25.1 IP) in 20 appearances following the All-Star break compared to a 1-0 mark with a 6.14 ERA (20 ER/29.1 IP) in 25 relief appearances before the break... Made his major league debut, April 3 at Pittsburgh … tossed a scoreless sixth inning (2 BB, 2 SO) in relief of Edwin Jackson... Earned his first major league win with 2.0 scoreless innings of relief in the Cubs 6-5, 14-inning victory, June 13 vs. Cincinnati (1 H), fanning a career-high four hitters... Made 13 relief appearances for Leones del Caracas in the Venezuela Winter League, going 2-0 with a 3.65 ERA (5 ER/12.1 IP). Missed most of the year with a right elbow strain ... had no record with a 1.29 ERA (1 ER/7.0 IP) in four games (two starts) between Double-A Akron and the Indians Rookie League team in August...Pitched in 23 games for Leones de Caracas in the Venezuela Winter League, going 2-1 with a 4.29 ERA (10 ER/21.0 IP)....Limited hitters to a .208 batting average (15-for-72)....Recorded a 13.1-scoreless innings streak from October 23-December 1, spanning 14 relief appearances. Still recovering from right elbow surgery, Hector appeared in just two games with Single-A Mahoning Valley ... had no record with a 3.00 ERA (1 ER/3.0 IP) ... was on the seven-day D.L. from April 7-September 21. Season was cut short by right elbow problems that eventually led to surgery that will largely keep him out for the 2011season...Made 7 starts at AAA Columbus after his option out of spring training, going 1-3 w/a 8.53 ERA (31.2IP, 48H,30ER, 10BB, 33K, 12HR, .343AVG)...Last start came on May 12 at Columbus....Worked at least 5.0IP in 4 of the startsand 6.0IP in 2 starts...Allowed at least 2 runs in all 7GS...Began a return to throwing program in July in Goodyear, Arizona and was shutdown with continued soreness in theelbow after several simulated games and surgery was subsequently recommended, ending his season...Underwentreconstructive UCL surgery on his right elbow on August 25 in Birmingham, AL by Dr. James Andrews. Hector spent the first half of the year at Akron and joined the Columbus rotation after being selected to theEastern League Regular Season All-Star team but did not participate because of his July 5th promotion...In 27games/25 starts between the two levels, he was 11-10 with a 3.38ERA (146.1IP, 61R/55ER, 137K) and limitedall hitters to a .256 average (143-558)... Named Indians Minor League Pitcher of the Year.u Before joining Columbus, he went 7-5 in 15 games/13 starts with a 2.75ERA at Akron (72.0IP, 60H, 22ER, 73K),including winning his first five starts of the year and carried a 1.23ERA (29.1IP, 22H, 4ER, 5BB, 26K) duringthe winning streak...Made 2 relief appearances (3.0IP, 7H, 4R/3ER) on May 12-15 when the Major Leaguebullpen struggled at the outset of the season...Did not allow a run over 3 straight starts, June 14-26, covering14.1IP...Limited EL hitters to a .227 avg against and had a 2.48 ERA as a starter...LHH batted .171 (22-129)off him...At the time of his promotion he was 8th in EL in ERA.u With the Clippers, he started 12 games and posted a 4-5 record with a 4.00ERA (74.1IP, 33ER, 64K)...He wonhis first three starts at AAA, giving up three runs in 18 innings of work (2BB, 20K)...In July, he was 3-1 andcarried a 2.74ERA in four starts (23.0IP, 7ER, 24K)...Over his first 7 starts in Columbus his ERA was 2.38 (41.2IP,43H, 11ER)...Went 6.0 hitless innings in his debut of July 8 vs. Indianapolis (6.0IP, 0H, 0R, 2BB, 8K)...Over hislast 3 starts at Columbus his ERA was 7.40 (20.2IP, 26H, 17ER, 5HR) that raised his Triple A ERA from 2.68 to4.00...Batters hit .282 off him at Triple A...Overall on the year walked just 29 batters in 146.1IP (1.8BB/9.0IP)and struck out 137 in 146.1IP (8.4SO/9.0IP)...The Venezuelan native led the organization in strikeouts, wasthird in total wins and fourth in innings pitched...Was 2-0 w/a 4.26 ERA in 6 starts in the VZ winter leagueafter the season.u Named the 8th best prospect in the Indians organization entering 2010 according to Baseball America. Spent the season at A Kinston where he went 11-6 w/a 3.60 ERA in 27 starts for the K-Tribe (145.0IP, 130H,58ER, 42BB, 145K)...Finished 4th in the Carolina League in wins, 2nd in strikeouts, 6th in innings pitched and8th in ERA...Among Indians minor league pitchers he was 6th in ERA, T5th in wins & led the organization instrikeouts...Was named a High Class A All-Star and the 9th overall prospect in the Carolina League by BaseballAmerica, and was also named as having the best Change-Up in the league by BA...Tossed a scoreless inningfor the World Team in the Futures Game...Went 4-0 w/a 1.29ERA in 5 June starts (28.0IP, 21H, 4ER, 34K)...Allowed only 12 HR in 145.0IP (.74HR all'dper 9.0IP) and fanned 1 batter per 1.0IP...Limited batters to a .239 (130-545) average against, as LHH (.238)and RHH (.239) enjoyed the same amount of limited success...Batters hit .245 (54-220) with runners on and.260 (33-127) w/RISP against him (.120, 6-50 with RISP-2outs)...Won 7 straight decisions from May 25-July4...Started the year 0-3 and ended up 11-6. December 15, 2017 Houston Astros signed free agent RHP Hector Rondon. December 1, 2017 RHP Hector Rondon elected free agency. October 14, 2017 Chicago Cubs activated RHP Hector Rondon. October 6, 2017 Chicago Cubs reassigned RHP Hector Rondon to the minor leagues. September 6, 2016 Chicago Cubs activated RHP Hector Rondon from the 15-day disabled list. August 19, 2016 Chicago Cubs placed RHP Hector Rondon on the 15-day disabled list retroactive to August 17, 2016. Right triceps strain. June 3, 2014 Chicago Cubs activated RHP Hector Rondon from the paternity list. May 30, 2014 Chicago Cubs placed RHP Hector Rondon on the paternity list. October 22, 2013 RHP Hector Rondon assigned to Leones del Caracas. December 6, 2012 Chicago Cubs claimed RHP Hector Rondon off waivers from Cleveland Indians. November 8, 2012 Cleveland Indians signed free agent Hector Rondon. September 26, 2012 RHP Hector Rondon assigned to Leones del Caracas. August 28, 2012 RHP Hector Rondon assigned to Akron Aeros from Columbus Clippers. August 27, 2012 sent RHP Hector Rondon on a rehab assignment to AZL Indians. August 21, 2012 sent RHP Hector Rondon on a rehab assignment to AZL Indians. April 5, 2012 Hector Rondon roster status changed by Columbus Clippers. December 9, 2011 Cleveland Indians sent RHP Hector Rondon outright to Columbus Clippers. December 6, 2011 Cleveland Indians designated Hector Rondon for assignment. October 1, 2011 Cleveland Indians recalled RHP Hector Rondon from Columbus Clippers. September 21, 2011 Hector Rondon roster status changed by Columbus Clippers. August 30, 2011 sent RHP Hector Rondon on a rehab assignment to Mahoning Valley Scrappers. March 11, 2011 Cleveland Indians optioned Hector Rondon to Columbus Clippers. October 13, 2010 Hector Rondon roster status changed by Cleveland Indians. May 13, 2010 Hector Rondon roster status changed by Columbus Clippers. March 19, 2010 Cleveland Indians optioned RHP Hector Rondon to Columbus Clippers. October 19, 2009 Hector Rondon roster status changed by Cleveland Indians. October 7, 2009 RHP Hector Rondon assigned to Leones del Caracas. July 5, 2009 Hector Rondon assigned to Columbus Clippers from Akron Aeros.